A very interesting, all but unknown variation. Adrian Sternfeld sought to find out about his M4 # 1414964 WITHOUT A SELF TIMER, with BLACK ENAMEL finish, has NO Self Timer, and it has a data strip insert like the MDa. 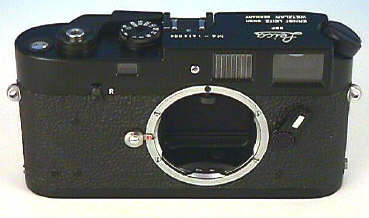 After further research, he received an answer from Leica. It turns out that a few of the last M4's made in 1975 were actually built on MDa bodies!! This accounts for the lack of the self timer, and the data strip insert. He was further informed that production of this variation is less than 200 cameras! This is entirely in keeping with long time Leica watcher's observations, that Leica did in fact do many things which were undocumented outside the factory. Such is the stuff that Leica's collector's dreams are made of. 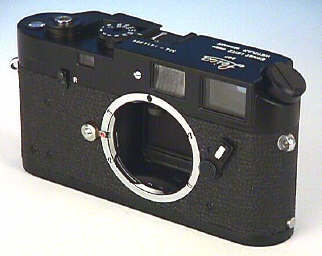 The inaccuracy of the "standard" Leica list brings up another important point. While mostly correct, it is hardly unusual to find mistakes in it. Nevertheless, it is still the best we have! 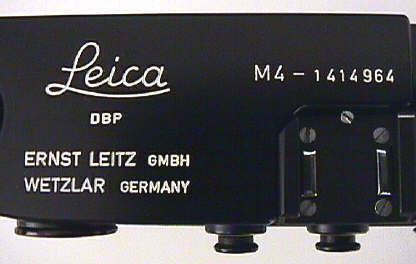 The M4 (MDa) is one of the least known, and rarest, of the M4 variations. 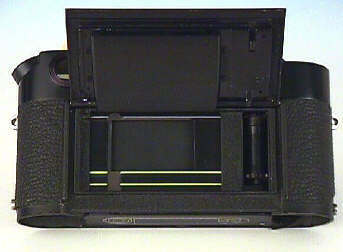 Notice the data strip channel on the left side of the film gate, like the MDa.